Europe Cruise 2009: ESTONIA?? WHERE?? 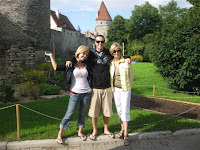 Just a hop, skip, and a jump across the Gulf of Finland we landed in the quaint and magical town of TALLINN, Estonia. 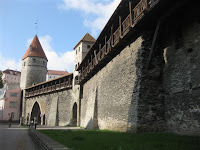 A small country, and an even smaller city, Tallinn is one of the oldest cities on the Baltic Sea and has remained remarkably unchanged for the past 600 years. The morning was crisp and fresh as we started along the walking tour we were advised to take of Old Town. The cobblestone streets were quiet as it was early in the morning and one of the first sights we happened upon was a group of people standing outside a “Sauna Bus” in their towels (apparently quite an attraction in these parts). We walked along the back of Old Town up to Toompea Castle where there were great views of the city and the Gulf of Finland. The Castle dates back to the 13th Century and is fronted by the town’s Parliament house, which is PINK! We wandered into a small park next to the Castle where Shawn spotted a red and yellow post normally used in the reality show “Amazing Race.” Just a few minutes later in barrels a panting camera man running in front of two of the teams! They frantically looked around the park for the clue (which was the post) and as I caught eyes with the girl from the yellow team I pointed toward the other side of the park where the clue was waiting. Ha! Imagine that? Of all places in the world you happen to see the Amazing Race being filmed in TALLINN! After this rush of excitement we walked down to the main square of town first passing through a restaurant called “Olde Hanse” which is most famous for it’s dedication to bringing alive the detail of the middle ages. The locals were all dressed in medieval costumes and were making a variety of crafts, clothing, and food outside the restaurant which is lit only by candles. 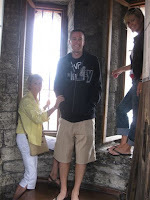 We then found ourselves paying 3 Euro each to climb up to the top of the Town Hall tower. Not only did each of the stone steps start getting taller and taller as we climbed higher but there was a rope to help pull you up along the side as it was so steep. At the top we could view the beautiful city through the narrow openings in the stone and could even see out to our ship in the port. After that we made our way through the atmospheric Old Town which was an enthralling hodgepodge of medieval streets and spires filled with old-world shops and cafes built into the rock walls. One of the most famous streets being St. Catherine’s passage was where we stopped to enjoy a glass of wine and an Italian meal. It was so peaceful sitting in this quiet street enjoying the charm of the city. We were feeling nice and toasty as the sun was shining bright and we dared to do another knee shaking climb along the city wall! This wall used to protect the city in its early days from intruders by sea, and there were plenty of old cannon holes which reminded us just how high up we were. After this point we meandered back along the edge of Old Town taking in the clean air towards our port. Right before we made it back to the ship there was a large wishing log looking out over the sea that we were advised to sit on and make a wish. This log was pulled up from the sea or from Africa or something along those lines, but whatever it meant, it felt so magical to sit in silence with the ocean breeze on our faces as we each made our wish feeling the warmth of Tallinn’s charm running through our bodies. Tallinn was spectacular!! Put it on your To-Do list for sure! Join us as we cruise through the Baltic Sea for 2 weeks on the Celebrity Constellation.